I could sense a slight panic in her voice as she asked me this. And it was a valid question from someone unfamiliar with the routines of taking children outdoors, in which seemingly innocent puddles of water can feel like a huge risk (or liability). It reminded me of how our understanding of “risk” is very personal and can change over time. My own perception of risk certainly has changed after years of being outdoors with children, and encountering and playing in puddles. But for this teacher it was all new and, understandably, a little nerve-wracking. Considering all the children were wearing rain boots and the puddle was only an inch or so deep, the question seemed a little odd to me. But I had to take myself back to my early days of delivering forest school and remember the anxiety that can come from unfamiliarity with an outdoor environment and lack of knowledge about what features could be considered “hazardous” or “safe”. 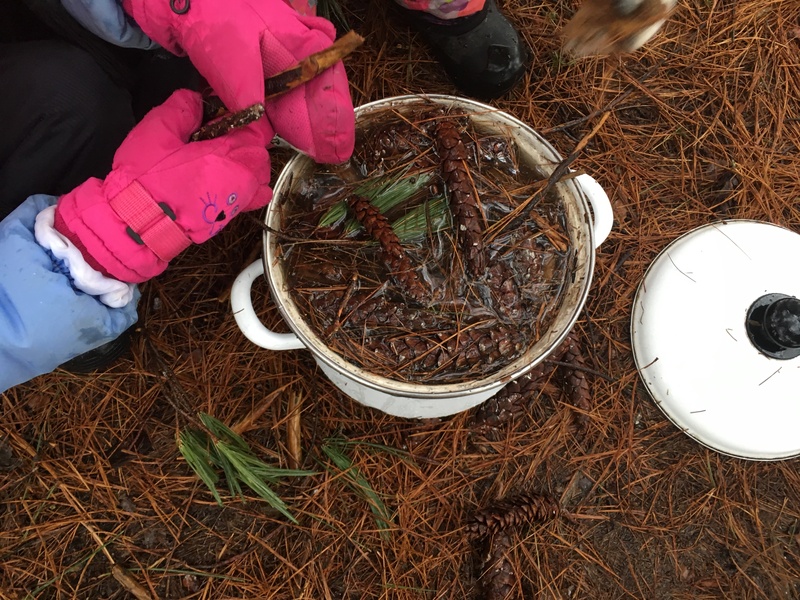 Once we made it to the forest and the children began to explore and play, they were naturally drawn to the puddles. Some brought over old kitchen pots and pans I had brought out with us and began to make soups and other imaginative recipes. And, as you may have guessed, others began to jump into the puddles. I saw the look of pure joy spread across the children’s faces with each new splash. Then I looked over at the teacher. Joy was not the emotion I would describe spreading across her face… It was more like fear. And I totally understood where she was coming from. These children were in school. Is puddle splashing appropriate behaviour for school?! Can this really be justified as learning? And what if they get completely soaked? Would they get uncomfortable? Cold? Be in danger? And what might other teachers, parents, the school administrators think? I conduct a daily Risk Benefit Assessment of the site directly prior to taking a group out in order to assess the conditions and identify any hazards, as the forest always changes in between our visits. I’ll take note of where the puddles are, how deep they are and decide whether any risk mitigation is necessary. Are there any puddles that are particularly deep or areas that are slippery? Is there anything I need to warn and discuss with the group at the start of the session? If play then arises that I hadn’t thought about before, I assess risk dynamically (in the moment) with the children. See Dynamically Assessing Risk for more about that. I consider the weather. If temperatures are cold and we’re planning to be outdoors for a long period of time, then getting wet may pose a greater risk. I’ll also take into consideration our abilities to regain warmth – Are we able to build a fire? Do we have changes of clothes? Do we have access to a warm indoor space if needed? I consider what the children are wearing. Are they dressed in waterproofs or sweatpants? Are their clothes mainly made of cotton (cotton has no insulating ability once wet)? How will what they’re wearing contribute to their comfort/discomfort in relation to the temperature and weather? I consider the children’s individual needs and personalities. Are they used to being outdoors a lot? Or is this a novel experience for them? Have they built up a resilience to being uncomfortable if they were to get wet and cold? Are there any children with sensory challenges or other additional needs? I consider the other adults present and not present who will be impacted by the play. Are we all in support of this type of play? Will those who have to deal with the aftermath of clean up and laundry be okay with this? 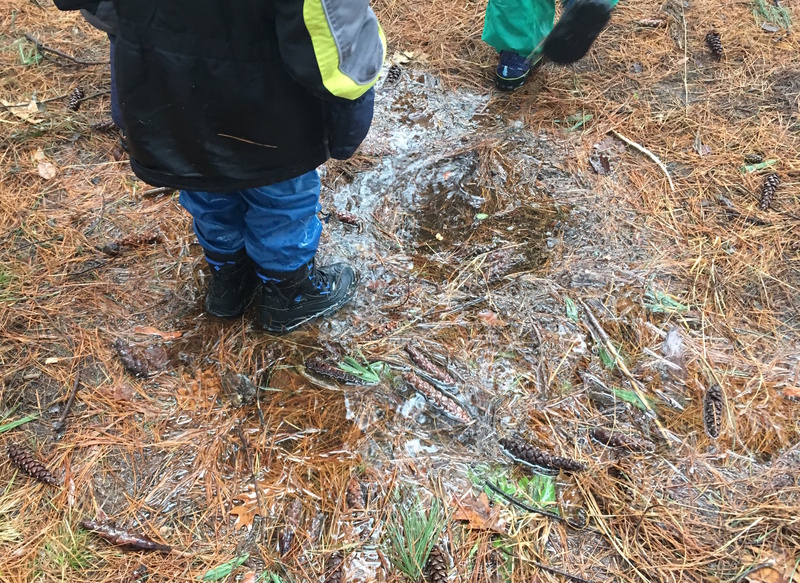 And I discuss all of these thoughts and questions WITH the children to empower them to make decisions for themselves about how they want to play in puddles. I was able to quickly walk the teacher through all of this thinking in relation to our observations that day. We talked about how the weather was not as cold as it had been in previous weeks, which reduced the level of risk. We talked about the children’s clothing and how they were (mostly) appropriately dressed with rain boots and waterproofs. (This was actually quite significant, as providing clothing has been a challenge within a public school system. For this program we relied on donations from the community and our own thrifting to do our best to outfit these children for the weather.) One particularly gleeful puddle-splashing child that concerned the teacher the most was wearing borrowed gear from the school. This meant concern over getting clothing wet and muddy was alleviated. Additionally, there had been clear communication previously with parents, teaching assistants, and school administrators about the program and all were supportive of getting the kids out in all weather. We also discussed the benefits of the children interacting with the element of water outdoors. They were actively participating with the natural phenomenon of weather and its connection to the land and us. They were noticing how it mixed with dirt and other debris to become more cloudy and brown. They were actively engaging their bodies in physical activity while jumping and splashing in it with their hands and feet. They were observing how their splashes got bigger and bigger the more force they put into it…. And how this annoyed their friends when it splashed onto others. So they were also learning to alter their actions and to splash in places and particular directions that wouldn’t get anyone else wet that didn’t want to be. And they were experiencing how the different fabrics of their clothes either got soaked or not depending on what they were made of and how those fuzzy cotton gloves get cold when you stick them into water (something to note for next time!). The play was rich in personal, social, and physical learning. Not to mention how much of it could be connected to curriculum standards around science, math, language, etc. 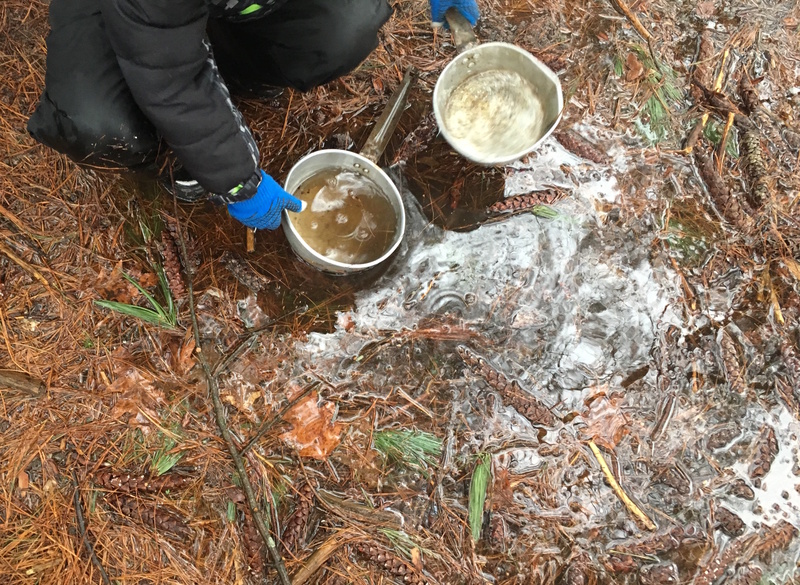 Ultimately, the teacher and I finished our chat with the agreement that the children participating in puddle play were not in any danger and the opportunities for learning were actually quite significant. The experience highlighted how our perceptions of risk and appropriate play are deeply influenced by social norms, like our beliefs around whether it’s ok for children to get wet (and maybe even a little uncomfortable?) and whether such an experience is valuable for learning. It also highlighted issues around access and equity inherent in outdoor play, particularly around children’s access to clothing that can help them stay comfortable in wet conditions. Moreover, it highlighted how our own personal comfort outdoors, as adults, truly dictates the experiences of children. As we become more comfortable being outside with the elements ourselves, so can our children.